Before its unveiling: A glimpse of "Along the Trail" by Donald L. Reed, a sculpture of President Ronald Reagan and his horse El Alamein. The Iowa Caucuses are over and the winners have (finally) been announced. Our nation is now one step closer to electing a new president. Accordingly, with all things presidential at the forefront of the news, and Presidents Day less than two weeks away, a visit to the Ronald Reagan Presidential Library seems a good way to keep in step with the times. Besides the impressive permanent exhibits that spotlight many of the achievements of our 40th president--including those during his political career, as well as his Hollywood career--the Simi Valley, California location also hosts various temporary exhibits and occasional community events. On Saturday, February 6, a special outdoor celebration will be held commemorating the anniversary of Reagan’s 105th birthday. Among the highlights of the day’s events will be the unveiling of “Along the Trail”, a 2,500-pound bronze statue by American sculptor Donald L. Reed of Rivers Edge Foundry. Commissioned nearly four years ago, the 11-foot realistic sculpture of Reagan astride his favorite horse El Alamein took the artist approximately 10,000 hours to complete. 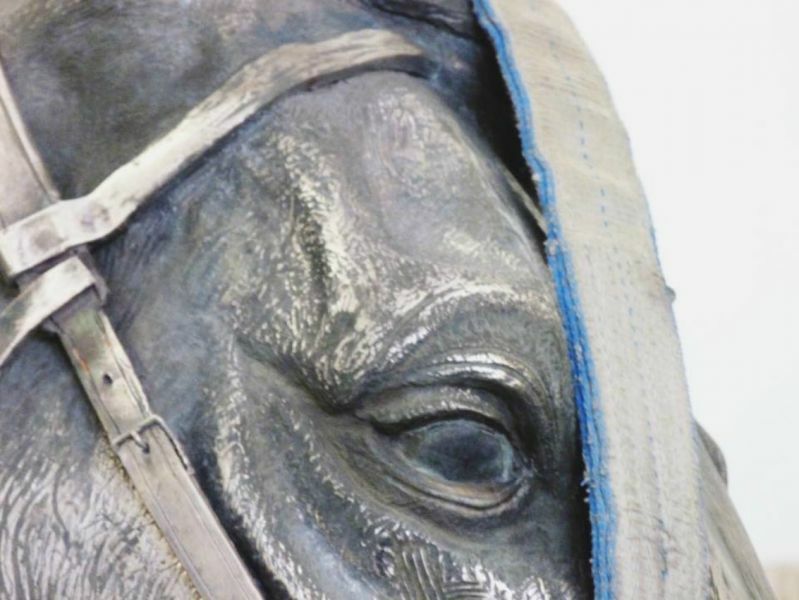 Interestingly, a belt buckle that once belonged to Reagan and an actual piece of the Berlin Wall are an inherent part of the sculpture, as they were both placed in a muslin bag and secured in a fireproof box that was then incorporated inside the horse. The life-size statue of Reagan on horseback will be permanently located near Air Force One Pavilion, allowing visitors to enjoy Reed’s creation in the rustic, western landscape. The schedule of other activities on February 6 kicks off at 10:30 a.m. with a musical prelude by the Camp Pendleton 1st Marine Division Band, followed by a flyover by the Tiger Squadron, Southern California’s premiere formation flying team, at 11 a.m.
Brigadier General Edward D. Banta from Marine Corps Base Camp Pendleton and Marlin Fitzwater, Reagan’s press secretary, will be part of the main ceremony that includes the laying of the Presidential Wreath at Reagan’s gravesite. As well, for a fee, a Birthday Lunch and Tour is also scheduled. On Monday, February 15, the Presidential Library will host its 23rd Annual Presidents Day Celebration. Among the day's activities, live musical entertainment, storytelling, and crafts will be featured. In addition, actors portraying historic personalities will perform in the Presidential Learning Center throughout the day. Besides the Presidential Library itself, the renowned Simi Valley location includes several other points of interest: a 6,338-pound section of the Berlin Wall—after all, it was Reagan who famously conveyed to Soviet statesman Mikhail Gorbachev that the wall be torn down—as well as, the Air Force One Pavilion, which has been the site of several Republican presidential primary debates. With its stately environs and plethora of historical artifacts, the Reagan museum complex serves as an esteemed site of American’s royal leadership and a cherished reminder of our ubiquitous, precious freedoms. (“President Reagan’s Birthday Celebration” is outdoors and is free to the public, although reservations are strongly recommended. Unveiling of “Along the Trail” will be at 2 p.m. The Presidents Day Celebration is also free to the public. However, please note, regular museum admission rates apply to view the Ronald Reagan Presidential Museum and the Air Force One Pavilion. The next upcoming temporary exhibit is “VATICAN SPLENDORS: A Journey Through Faith and Art”, which opens on March 6, 2016 and continues through August 28, 2016.